I believe the last time I checked in with everyone, I was bragging about how my kids were finally back in school after a two week break. Well. I should have known better! Just as fast as they returned to class, they were back at home (one after the other), sick with a virus. Luckily (?) they didn't overlap. My daughter for the first week and my son for the second. I am happy that I am fortunate enough to stay home and be able to take care of them...although it did slow down the progress in the sewing room! Everyone is now healthy again (knock on wood) and I was finally able to finish this 20" x 20" pillow with 169, 1-1/2" half square triangles (HST). 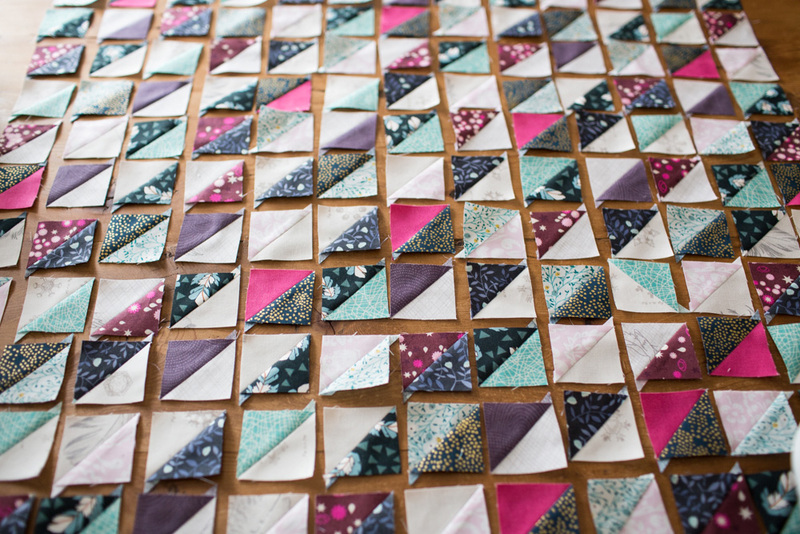 I really do love HSTs, but there is no way I would make 1-1/2" units without a shortcut. Unfortunately, I'm just not that patient or precise. My good friend Lee of Freshly Pieced came out with these Perfect HST templates, and it was SO easy to make these in bulk with no squaring up. I think I made 11 sheets worth for this pillow. I love that I could print them at home and there were lots of size options in the template packet. I used a 20" pillow insert, and made the pillow slightly smaller (probably finished around 19" x 19") so it would look nice and full. I quilted it with diagonal straight lines about 1/4" on each side of the diagonal seams. It's nice and soft and a perfect addition to my sewing space!